Remember Dr. Eve Riser-Roberts' cat parody paintings we featured a few weeks ago? Her fine art print parody of Jackson Pollock's cat was my very first "Pinterest-prompted" purchase. Well, today's Fun Find is also from Dr. Riser-Roberts...and it's absolutely free. Using the program BrainsBreaker 5, she's created a free puzzle you can download, and it features her van Gogh cat parody, "van Gogh's Very Bad Cat." 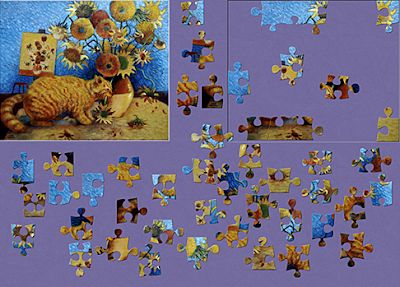 In order for you to play the puzzle, you'll need to install the program on your PC or Mac - the instructions are at The Cat Gallery site here. For every tweet and blog post featuring the #BTC4A hashtag (short for Be the Change for Animals) from October 22-27, Petco will donate $1 for rescue pets – up to $5000 – at this weekend's BarkWorld event. Click the image below to tweet - it's a quick & easy way to help raise funds for shelter animals. It's free to all our British friends! Fanks you for the fun-to-be information. Do one of you kittehs have Soft Paws nail tips? I thought I saw them once in a picture? Great puzzle idea. Have a fabulous Friday. My mom LOVES to lay puzzels ! Oh our Mom loves to do puzzles. WE will have to look into doing that. What fun. Take care. That looks like fun!! Will check it out for ipad!! Hi Mollie! Hi Alfie! Mowzers, we didn't think it mattered where you lived. You mean the download is US only? Oooops! The puzzle looks like fun. Our mum loves puzzles but she better not cut our computer time back so she can do it. Hi guys! We have been bugging LP to send you a note but she is far too good at ignoring our requests...until today, finally! We wanted to say hi and thanks for dropping by :) Also, Malou would like to take you up on that wand toy snafu. She thinks that would be a purrfect pawty invite! Hi! Hi! Hi! Come on over! After today my brain feels teased fur sure! Woo! Hoo! Me LOVES doing puzzles this will be fun! Well, even though my Human hardly EVER helps me tweet, she did this one! Say, the Human goes to a site called jigzone.com all the time, but it does not have such cool paintings as this one! Go GIANTS! That puzzle is awesome - and it is my favorite painting of hers!